MIDI signal in oscilloscope. Inverted serial 31200 bits per second. Captured from USB->MIDI adapter (SWIS). First bit time is about 32us (31.2us = microsecond ). Voltage difference was 3.92V. MIDI is an asynchronous serial interface. The baud rate is 31.25 Kbaud (+/- 1%). There is 1 start bit, 8 data bits, and 1 stop bit (ie, 10 bits total), for a period of 320 microseconds per serial byte. The MIDI circuit is current loop, 5 mA. Logic 0 is current ON. 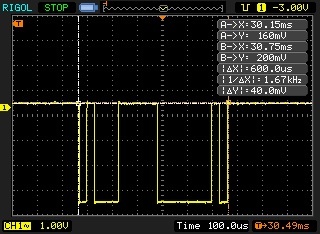 To avoid grounding loops and subsequent data errors, the input is opto-isolated. It requires less than 5 mA to turn on. The Sharp PC-900 and HP 6N138 optoisolators are satisfactory devices. Rise and fall time for the optoisolator should be less than 2 microseconds. The standard connector used for MIDI is a 5 pin DIN. Separate jacks (and cable runs) are used for input and output, clearly marked on a given device (ie, the MIDI IN and OUT are two separate DIN female panel mount jacks). 50 feet is the recommended maximum cable length. Cables are shielded twisted pair, with the shield connecting pin 2 at both ends. The pair is pins 4 and 5. Pins 1 and 3 are not used, and should be left unconnected. Previous PostWorking MD5 for Objective-CNext PostHow to remove the gloss / glare / white area from iPhone app icon?